They lived for two years and 20 minutes under the glass of a miniature Earth, complete with an ocean, rain forest, desert, grasslands and mangroves. Their air and water were recycled, and they grew the sweet potatoes, rice and other food they needed to survive. About 1,500 people were invited and some 200 journalists were on hand as the eight original inhabitants of Biosphere 2 left their glass terrarium a quarter-century ago last month in two groups that no longer talked to each other amid the stress of sharing a small space and disputes over how the project should be run. Detractors called the $150 million experiment a failure because additional oxygen was pumped into what was supposed to be a self-sustaining system. A power struggle in subsequent months led Texas billionaire backer Edward P. Bass to hire investment banker Stephen Bannon, who was later President Trump’s chief strategist, to bring the project back from financial disarray. Today, Biosphere 2 is a different kind of place, a University of Arizona site where researchers from around the world can study everything from the effects of the ocean’s acidification on coral to ways of ensuring food security. That means researchers from the Global Institute for Water Security at the University of Saskatchewan in Canada don’t have to worry about harming the environment while studying how plants in the tiny rainforest adjust their water consumption. The miniature ocean is being renovated so researchers from places including the University of Hawaii can continue experiments on a miniature reef without hurting reefs in the Pacific. A $550,000 grant from Johns Hopkins University is helping scientists test theories about water movement on three artificial hillslopes known as the Landscape Evolution Observatory, a gigantic Earth science laboratory. 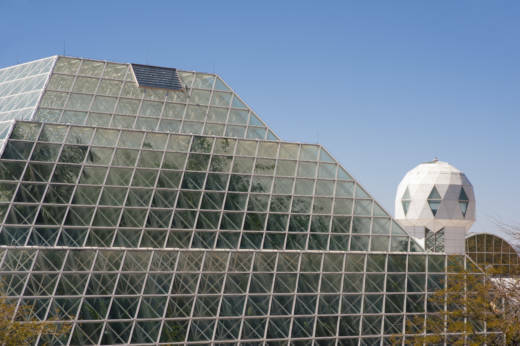 The university assumed management of Biosphere 2 in mid-2007 and in June 2011 announced full acquisition of the glass-enclosed area of just over 3 acres (1 hectare) that reaches as tall as 75 feet (23 meters) in some places, and the buildings and grounds around it. Like Dukes, independent ecologist Christopher Field, director of the Stanford Woods Institute for the Environment, said Biosphere 2 has proved useful for science in its current iteration. “It is an important piece in our portfolio for understanding climate change,” he said. Biologist John Adams, Biosphere 2′s deputy director, has been with the project since 1995, when he was a new University of Arizona graduate. “It’s always been an audacious, ambitious project,” he said. Adams said 55 people now work at the site, including 30 researchers. Bass donated $30 million to Biosphere 2 last year and sits on its advisory board. Poynter said that since she and the other “Biospherians” emerged from the greenhouse, much of the original animosity has faded away. The initial project was the brainchild of systems ecologist John Allen, and Bass was financial backer when the first group of four women and four men entered Biosphere 2 on Sept. 26, 1991. Now almost 90, Allen lives quietly in Santa Fe, New Mexico. A mission by a second group was terminated early after Bass ousted Allen and other top managers in April 1994 and temporarily made Bannon acting director during a management dispute. Bannon led the project for about two years, and Columbia University then took over, changing the once virtually airtight structure to a “flow-through” system and manipulating carbon dioxide levels to study global warming. Poynter and Taber MacCallum later married and settled in Tucson, where they operate World View Enterprises, a company that is pioneering flight to the edge of space with high-altitude balloons. They met during training for Biosphere 2, and their romance flourished after entering the enclosure. The couple hopes World View’s high-altitude remote-controlled balloons will eventually be used for weather monitoring, communications and research at a fraction of the cost of satellites. They are also working on a craft called Voyager, which they want to use to take people some 100,000 feet (30,480 meters) above Earth. Crew members Abigail Alling, Mark Van Thillo and Sarah Silverstone work with their Biosphere Foundation, which conducts marine research in southeast Asia. Fellow crew member Linda Leigh, a botanist lives near Biosphere 2 in Arizona. Crew physician Roy Walford, a well-known researcher on the effects of a low-calorie diet on longevity, died from Lou Gehrig’s disease in 2004 at age 79. In the book, Nelson reflects on the group’s experiences and calls on people to renew their relationship with nature to help reverse trends threatening the original biosphere, Earth.